You often have limited space in your kitchen, particularly when it comes to countertops. When you need to find somewhere to put a range of small appliances, this can prove to be tricky. A microwave is a must for many American kitchens, but they can take up precious space. It might be space you’re willing to sacrifice if you use your microwave a lot, but you don’t have to if you consider the option of a microwave stand. On one of these you can store your microwave, pots, pans, pop corn maker and all manner of utensils. Using a microwave stand with storage saves space on your counters and gives you a neat system for keeping your kitchen organized. We have taken a look at some of the top products on offer to help you find the best microwave stand to meet your needs. The Lifewit Microwave Over Stand is a value option if you’re looking for your first microwave stand. It is designed to be compact and durable and will hold up to 66 pounds. It measures 21.6″ x 13.8″ x 47.2″. The open-wire shelves are adjustable, and it has a top shelf, three lower shelves, and four hooks for versatile storage. Although the product claims to be durable, it is not as well-made as some other products, which can be expected when you choose a value microwave stand. The small size might be ideal for some, but anyone who has a larger microwave, needs more storage space or wants the stand to be level with their counters will be disappointed. The Lifewit 4-Tier Bakers Rack is an excellent investment if you’re looking for a cheap microwave stand. Its small size is ideal for small kitchens or other places where space is limited. However, if you’re looking for a product that will last a long time and that will look and feel durable and sturdy, you might want to consider spending a bit more on a stand with better construction. This affordable option is a good price, but you get what you pay for in terms of quality. It can seem a little flimsy and unstable, although should perform well on an even floor, used as both a microwave stand and a storage space. The Finnhomy 4-Tier Microwave Stand is a highly-rated product, giving you a durable and roomy stand for a reasonable price. 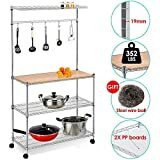 It features adjustable shelves and a thick bamboo top/cutting board, a slim top shelf for spices, cups, etc., and a rail with free hooks so you can hang items such as utensils too. 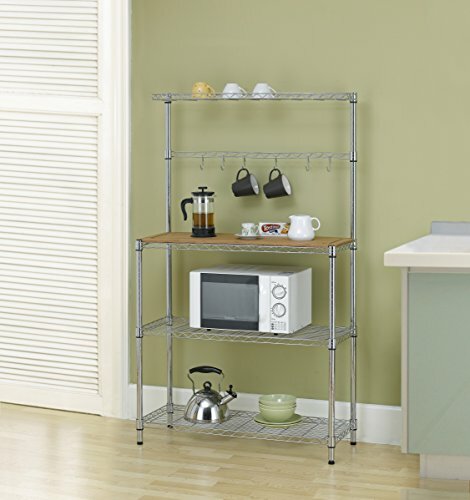 At 36″ x 14″ x 61″, it can hold up to 250 lb per shelf and is made from high-quality, anti-rust chrome. The high maximum load capacity makes this unit ideal for microwaves and other appliances, and there’s plenty of other space for storage too. This is a quality unit that offers durability and a lot of storage space, without taking up too much room. It is easy to assemble, and the adjustable shelves are useful. The addition of the cutting board is a nice touch for food or drink preparation, although we discovered that it stains very easily. Being able to store various items at different levels is handy, especially when you need to get organized in a small kitchen. 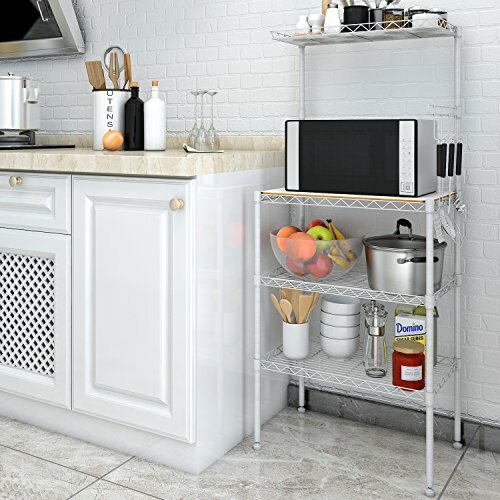 You won’t regret buying the Finnhomy 4-Tier Microwave Stand if you’re looking for an affordable, quality storage solution for your kitchen. It holds an impressive amount of weight, and it offers the durability that it claims. The bamboo cutting board is a great idea, although it stains easily. It’s simple to set up, and you can use it in a variety of ways, making it excellent value. Not only can you use it for your microwave, but you can store other appliances too, as well as various food and kitchen accessories. 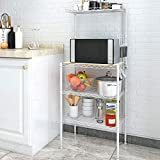 The Yaheetech 4-Tiers Adjustable Kitchen Bakers Rack offers a multi-functional microwave stand which, unlike some similar products, can be moved on its four wheels. Measuring 35″ x 14″ x 61″, it’s not too big but still offers plenty of space. It has three lower shelves, plus a slim top shelf, as well as a hanging rail with five hooks. It’s made from a rust-resistant material, with a free bamboo cutting board and two PP boards. The main shelves will hold up to 220 lbs each when the unit is not on its castors. Perhaps the best feature of this microwave stand, which helps it stand out from the rest, is its four castors. Being able to move it around is extremely useful, especially if you have limited space and want to be able to tuck it out of the way when not in use. The castors can be locked too, so the stand won’t move around when you don’t want it to. The best feature of the Yaheetech 4-Tiers Adjustable Kitchen Bakers Rack is undoubtedly the ability to move it around. This offers an advantage for people who have limited space or just like to move things around. Combined with the durable shelves, it’s a good choice for a microwave stand or for storing other kitchen appliances and items. 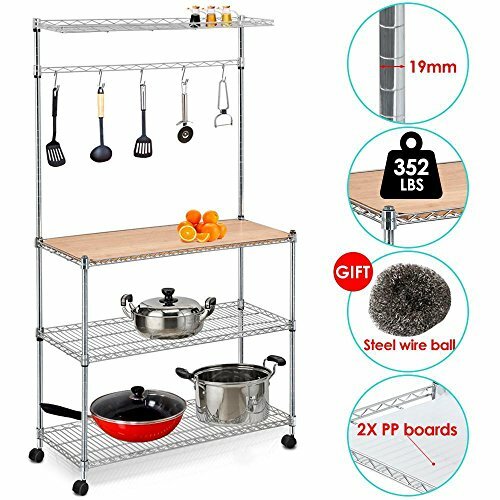 However, there are a couple of issues to be aware of, such as the height, which can make it difficult to use for food preparation. Summary: Which is the Best Microwave Stand with Storage? Using our reviews of these top three microwave stand options, we have compared the products to choose the one we think is best. Although they might look similar on first glance, they all have their advantages and disadvantages. While we think each of these microwave stands offers a good option the Yaheetech 4-Tiers Adjustable Kitchen Bakers Rack is our top pick for your kitchen. It holds a lot of weight and has versatile storage, plus it offers the ability to move it around and secure it in place with the lockable castors. The bamboo and PP boards are nice touches to round off a durable product. The Finnhomy 4-Tier Microwave Stand is the runner-up in the race. It offers many of the same features, but can’t be moved. Still, it is durable and versatile, with plenty of space. The Lifewit 4-Tier Bakers Rack comes in last, but it still offers an affordable option if you want a compact microwave stand. It’s not as durable as the others and will be a bit unstable for larger microwaves but it will be fine in a smaller apartment with a small microwave.